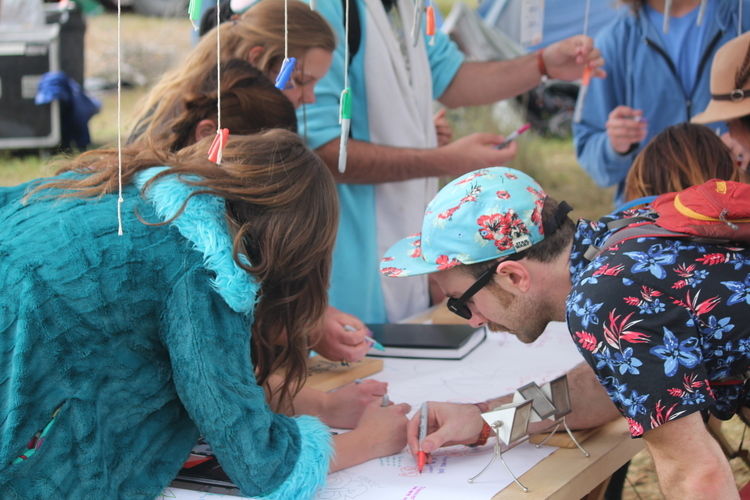 During the first Lucidity Festival in 2012, Brian Coe walked around Live Oak Campground. He saw tons of different expressions of art. Well represented were visual artists, musicians, flow artists and dancers, stage designers… almost every form of art you can imagine, except Brian’s favorite — written word. The following year, Brian came back with his own piece of the puzzle to fill the gap. He created a simple installation from a shade structure with four blank canvas walls and hung a rainbow of sharpies from the rafters. He called it “Step Write Up.” Brian asked festival attendees to inscribe messages of hope, humor, and wisdom on the walls. After hosting Step Write Up at Lucidity for 5 years, it was time to evolve the project into something bigger and better. 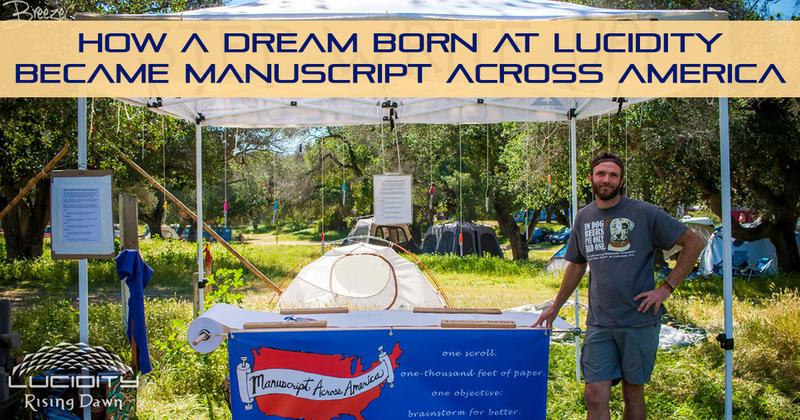 And so, Manuscript Across America was born. The concept was to bring a 1,000 foot roll of blank paper to public spaces across America, capturing a bit of the minds of everyone along the way. Brian encouraged people to write messages on ways to improve themselves, each other, our country, and the planet. The Manuscript crew visited National Parks, presidential rallies, small towns and major cities to weave a diverse tapestry of voices representing differing views held across our country. His journey took place during what we now know was one of the most pivotal times in recent history, the summer leading up to the 2016 election. Alongside the manuscript, Brian and his companions filmed his journey and interviewed many of the people who wrote on the scroll. A documentary was created as slightly more portable companion piece to the scroll. Consisting mainly of interviews and a few of Brian’s thoughts along the journey, the documentary captured so much of the fear, hope, and energy that our country was feeling at that time. Brian always came across as respectful to everyone’s point of view, and let them speak their minds without debate or criticism. This was extra important as the project is rooted in the principle of free speech. One of the things that has become abundantly clear during this time is how much of a difference in opinions, struggles, and needs we have across America. You will certainly hear some views that you disagree with. Personally, while I wasn’t swayed in any way, there’s something important about humanizing opposing views, and hearing why people felt a certain way. Overwhelmingly, all across the country there were messages of love and hope for America and humanity. I can’t recommend this documentary enough, there’s a lot of power in hearing from so many voices and a solid reminder that although we have very different views, we are all one human family. Check out the trailer below, then see the full documentary for free here. Also if you check out the Manuscript Across America blog, there is more information on the project and written updates from Brian during the journey. We love it when a dream born at Lucidity manifests into reality! What dreams of your own have been conceived at Lucidity?